Double Chocolate Chip Shake. Cold. Classic. Vegan. Your Chocolate Shake Craving: Satisfied. Walking by NYC'S Sundaes and Cones ice cream shoppe in the East Village, a line out the door on the first ninety degree day of spring, my husband asked, "I wonder if they have soy flavors. That looks good." He gawked at a customer's frosty chocolate shake. I gave him a squint, "You know, I make a really good vegan double chocolate chip shake. Dark chocolate chips!" His eyes perked up. His hot day chocolate shake craving was about to be appeased. Tips and Tricks. First off, you can't simply dump all the ingredients in at once and blend. Shake blending with soy is a process. And if you don't have a professional malt milkshake blender, which I don't, you'll need to learn a few blender tricks. 1) Yes, you'll need to shake the blender a bit. And switch the blending off frequently, to mush down the soy cream into the bottom of the blender. 2) Adding ice cubes helps to keep the shake ice cold, amidst the high speed blending which can produce a bit of heated energy. Ice keeps it frosty cold! If you are really dedicated, make soy milk ice cubes. 3) Add enough milk to start. You'll need to make sure your blend starts off a bit more liquidy than the end product. By adding most of the milk early on in the blending, you'll get a nice productive blend to occur and you can slowly add in more soy cream and ice to thicken the texture without melting the soy cream by over blending. 4) Fruit is your friend. Adding in a bit of frozen fruit will add texture and make for a healthier shake. Raspberries with chocolate, frozen banana with a peanut butter chocolate shake, blueberries or strawberries all make for a nice compliment to a cold creamy shake. 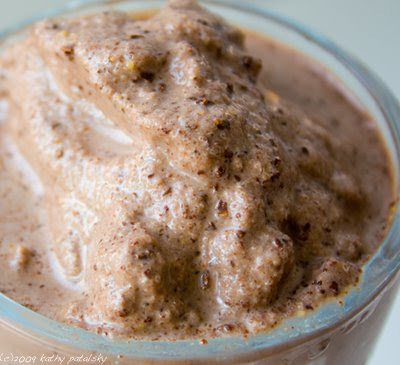 5) Adding in cocoa powder will up the chocolate flavor and antioxidants even more! Plus it creates a nice thickness to the shake. Retro Taste. Without the Guilt. 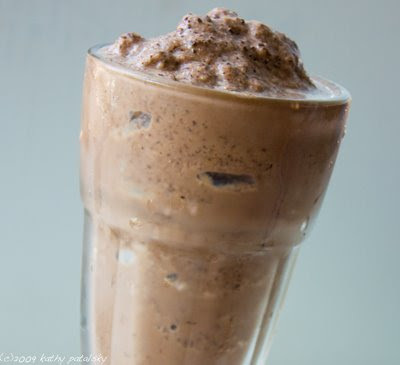 Soy cream and soy milk variations to the classic chocolate milkshake recipe make for a healthier vegan version. Call it a Milkless-shake. And by using dark chocolate from a high quality vegan chocolate bar instead of traditional milk or semi-sweet chocolate chips, you get more antioxidants and none of the milk fat. And using soy milk and soy cream instead of dairy milk, you will cut drastically down on fat and saturated fat. Plus you'll get all the protein, vitamins and soy isoflavones found in soy products. optional:1 tsp cayenne-Mexican Chocolate flavor! Technique is crucial here. It is tricky to blend a soy shake, but with practice you will be a pro! First, make sure soy cream is softened slightly. Rock hard soy cream will not blend up well. Add 3/4 cup milk to blender. Add 3/4 of the total amount of soy cream. Add the 2 tsp of peanut butter. Blend on med-high. Shake blender to facilitate blending. Turn off blender and with a wooden spoon, smush down soy cream. Continue blending until the ingredients get cream. Add in the remaining soy milk, banana, cinnamon, cocoa, dark chocolate salt and ice. Blend on low for a nice thickness to occur. If shake is too thick, add a tad more milk. For a thicker shake add more soy cream. Add more ice if you want an icier shake. 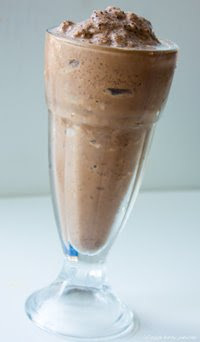 Pour into a frosted shake glass and add a straw or long spoon. Garnish with cocoa powder and cinnamon. Notes: You can omit the banana if you want a 100% chocolate shake. Or you can add more banana for a thicker choco-banana flavor. 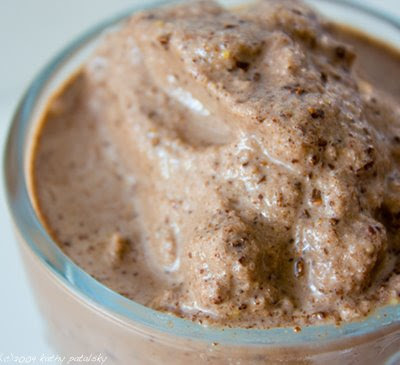 The 2 tsp dab of peanut butter goes great with this smoothie, but you can always omit that as well.